Are you on a budget all while trying to decorate your new place? Don’t sweat it, we’ve got you covered. 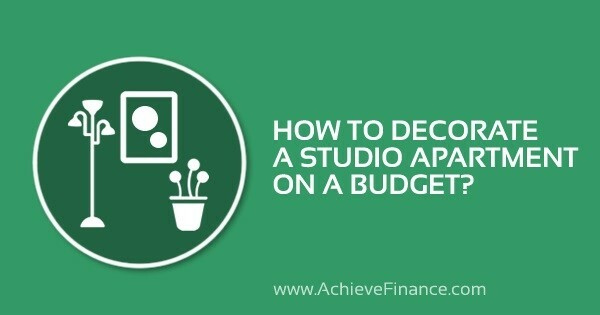 Although it might appear quite challenging to decorate your studio apartment at low cost, we guarantee that by following a few simple tips and tricks, your new home will look fantastic without burying yourself in debt. If, however, you do need a little extra hand in putting your decoration project together, you can search for a payday loans online. The latter type of providers offer the quick money you’re looking for. Although your studio apartment may be built of a kitchen, bedroom, living room and bathroom all sharing the same place, the following tips will help you maximize space, get creative and demonstrate some real decorating talent! We all know how moving into a new place can be an exciting, yet stressful, moment. Of course, moving comes at a cost – including purchasing essentials like a couch, a kitchen table and probably a few dishes. Then, there comes the moment where you feel you need to make your new place look like home. This is where you need to remember that decorating doesn’t have to break the bank! Sure. your one-bedroom apartment has got to serve many purposes – including a kitchen and dining area, a sleeping area and even a washing area. However, this doesn’t mean we need to see or use all the areas at the same time. Start by considering fold-out furniture such as a Murphy bed or drop-leaf tables. Or, if you’ve really got the knack for at-home decorating, think about hiding everything like was completed in the 140-square foot apartment. There’s no reason to deny it – your studio apartment is probably really small. You may be thinking to yourself: There’s no way I can set my bed up in here! Before you panic and tell yourself you’ll be sleeping on the couch for the next year – check to see if you have any closets that you can enclose the bed into. If not, think about draping curtains around your bed for a little extra privacy. Doing so will genuinely help turn your studio apartment into a home instead of an open living space. Always remember that windows and natural lighting will help in making your new home appear bigger and more luminous. Most of the time, curtains and blinds will already be installed when renting a property however, if this isn’t your case or you’d prefer a change in styles then consider creating your own all while respecting your budget! Better yet – you don’t need any sewing skills. Look for fusible bonding web, which is generally available at all fabric and craft stores. Use this material to create panels of fabric for windows and doorways. There are two ways you can bring mirrors into your new place – making it look bigger and increasing the amount of natural light reflecting throughout the room. You can hang mirrors on walls or leaning against the floor in specific areas of your studio apartment to increase the roomy feel. You can equally purchase mirrored furniture – a two in one! You can add additional light fixtures to a room to brighten up a gloomy space. There are many types of lighting so make sure you think of them all: Overhead lighting, lamps for dimmer lighting as well as floor lighting or accenting lighting for decorations! Remember that when it comes to renting a property, you’re usually not entitled to changing the light fixtures. However, make sure you mention any lighting problems, such as a broken or nonfunctional ceiling fan, then this might be worth mentioning to your landlord. Avoid making your studio apartment feel like a cluttered closet by disguising your storage space. Think of furniture that has more than one use, like an ottoman with storage inside or using a trunk for a coffee table. Another top trick in camouflaging your storage space is by painting, or purchasing storage items that are the same colour as your apartment walls, allowing the storage to blend into your studio apartment without dominating the space. Craving a little colour and personality in your new studio apartment? Start by going the non-expensive route and look for vintage or homemade decorations. Adding colour is completed simply enough by adding a few throw pillows or blankets to the couch. Small accessories also go a long way such as pottery, picture frames of family and friends or even a bookcase with all your favorite authors! Finally, think about adding a little touch of green to your new home with a few plants. Aside from being extremely affordable, plants are generally easy to care for and have a true knack for bringing a room to life. There are even certain plant species that require very little care – if any at all! In the end, you can clearly see that decorating your new studio apartment can be completed in a very affordable way. Take the time to plan what type of decoration style you’re looking for and from there, choose your items wisely. If you keep the above tips in mind when it comes to personalizing your one-bedroom apartment, then you’ll be relaxing in your new home in no time.